The United States may have superiority in most domains — sea, land, air, space — but it lacks the kind of whole-of-government integration currently allowing near-peer adversaries to excel at a level of “adversarial competition” that falls short of the definition of war. That’s what Chairman of the Joint Chiefs of Staff Joseph Dunford told lawmakers at his Sept. 26 re-nomination hearing. “We need to adapt the U.S. military — really, the entire U.S. government — to be able to compete at that level below war, where the Russians have so successfully integrated information operations, cyber, political influence, economic coercion and information operations,” Dunford said. He said the U.S. needs to improve its capabilities to compete in that space, especially cyber. But while the Defense Department is beginning to work on that, it will require stronger integration with the civilian side of the government, as well as stronger public-private partnerships in order to be competitive. But improving capabilities isn’t going to be easy in the current environment, where operational demands are exceeding supply and readiness is suffering from a lack of budgetary predictability or sustainability. Dunford said that in the past, the military has used a bottoms-up approach to force readiness. Each commander provided their own requirements, and DoD did its best to meet those requirements equally across the force. But for the first time, Dunford said DoD will be implementing a top-down approach, where DoD will determine what forces need to build readiness, and will not allocate them while they’re doing so. The main issue with readiness, as several defense leaders have testified in the past, is Congress’ reliance on continuing resolutions, as opposed to full appropriations bills to fund the government. It’s an argument lawmakers have heard before. Some, like McCain, can repeat it word for word. But the predictions DoD has been making for years are starting to become reality, and lawmakers aren’t sure yet how to deal with that. Some of the services are currently experiencing high-profile consequences from trying to operate at too high of a tempo without maintaining readiness. The recent collisions of Navy ships in the Pacific, and a GAO report that found declining maintenance and readiness due to increased deployment lengths, less training and deferred maintenance, have prompted soul-searching within the service regarding readiness. Dunford said he recently visited the USS Barry, which had been at sea for 70 percent of the previous 12 months, which he called unsustainable. Sen. Tom Cotton (R-Ark.) asked whether an incident earlier this month, when more than a dozen Marines sustained injuries during a training exercise in California, could be ascribed to the same conditions. “I can’t talk to that specific incident, but I am confident that a combination of fiscal challenges and high operational tempo have created conditions that actually have led to some of these incidents. Of that, I’m confident,” Dunford said. Meanwhile, the Air Force is being forced to cut some of its training programs due to lack of funding. McCain asked what effect this was having on the average service member. But Dunford said even the metrics by which training is judged have themselves changed in response to the current circumstances. “And I would argue that, while we may have trained to standard in the past when we had sufficient time and resources, now, we’re training to time, because that ship is going to go to sea, that pilot is going to go to war, that infantryman is going to go to war, whether or not they’ve had an opportunity to retrain in the basic tasks or not,” Dunford said. 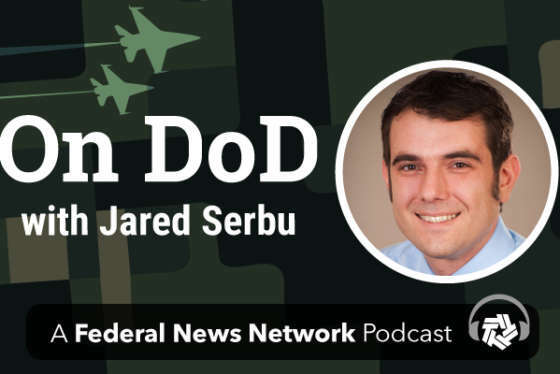 WEDNESDAYS, 11 A.M. & 2 P.M.
Each week, Defense Reporter Jared Serbu speaks with the managers of the federal government's largest department. Subscribe at PodcastOne or iTunes.